DISCLAIMER: This is not a healthy post……..
…….. but they just sounded so good I had to try them. The link for this recipe was from a pinterest post I found a couple of weeks ago (another reason to join). Substituting buttermilk in the recipe for the 2/3 c greek yogurt and 1/3 c almond or nut milk did work very well. The texture was fine and the cupcakes tasted great. I didn’t substitute the vegetable oil because I was afraid I’d be really changing the stability and consistency of the cupcake if I changed around too many things – I’m notorious for screwing up baking projects. Now, when I attempted to use the butter substitution for the Moscato icing (using 1/4 c greek yogurt and 1/2 c butter) it did NOT work out. The mix was lumpy and curdled-looking after I added the vanilla and wine. I thought maybe the addition of the confectioners sugar would change this, but it did not. I have a feeling the wine has something to do with this method failing too. My reasoning: even after dumping this batch of icing and making it with the regular requirement of butter I could not get the icing to a thick consistency. I added a fair amount of confectioners sugar before I decided I really was adding too much (didn’t want it to be too sweet) and it still remained semi-runny. Blame it on the alcohol. 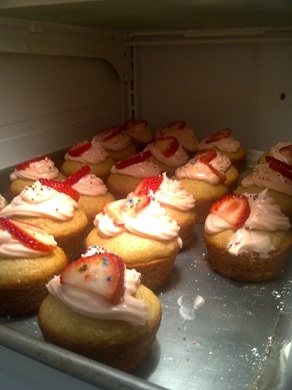 However, I iced the cupcakes, sliced and added the fresh strawberries, and sprinkled a little bit of sprinkles on top and they are now residing in the fridge until I take them to my boyfriends family tonight. Good news is, the icing set and hardened a little and the cupcakes are still delicious. Hope they hold up on the ride! Comment if you know of any healthy substitutions of your own for “junk food” recipes! I’d love the feedback!